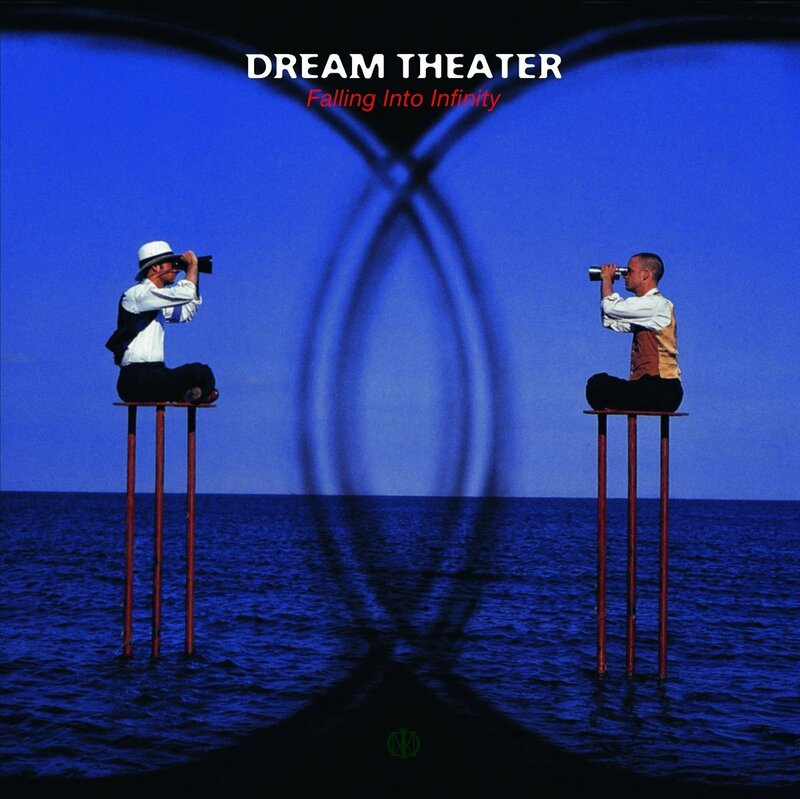 “Falling Into Infinity” is a very unique Dream Theater album for many reasons. It is the only full length with Derek Sherinian on keyboards. It’s the only studio album that does not have the classic Dream Theater logo. It’s the only album produced by Kevin Shirley, who did go on to mix their next few albums. The album came at a time when the band was forced to change directions, due to both internal and external forces. Following the recording of their classic “Awake” album, original keyboardist Kevin Moore abruptly quit the band. Kevin was key to not only the sound of the first three albums but he also was one of the main lyricists. As a bit of a stop-gap the band released the “A Change of Seasons” EP featuring an updated version of the title track. Since Kevin co-wrote the song, it still was nothing new to the new lineup which now had Derek Sherinian on keys. The band began writing for the album in 1996 and recording demos. The record company was not all that interested and didn’t even allow the band to start recording the album until 1997. Considering the momentum that the band had, this was only the start of the problems. Kevin Shirley was brought into produce them as well. While he was great at engineering Rush albums at the time, his idea that Dream Theater should sound like Deep Purple was misguided to say the least. Shirley listened to the 1996 demos and decided that many of the earlier songs like “Raise the Knife” and “Where are You Now” were not good enough. He also asked the band if he could give the song “You or Me” to his friend and renowned songwriter Desmond Child to see if he could do anything with it. Shirley also pulled apart the song “Burning My Soul,” extricating the instrumental section and having them write a new song, “Hell’s Kitchen,” with it. Add in that he decided that the ballad arrangement for “Take Away My Pain” was “too 80s” and turned it into a strange calypso beat driven song. Some of his ideas worked and some did not. I am sure many people piss all over the revamped “You Not Me” just because it has Desmond Child’s name on it and it is catchy as hell. The bottom line for me is that the song sounds great with those changes. Pulling out “Hell’s Kitchen” was a good idea too because it created one of the band’s best and most underrated instrumentals. But what about the rest of the music that made it to the album? Many of the songs show the band experimenting with different sounds and ideas. It wasn’t just Kevin Shirley pushing the band to try new things. Without Kevin Moore, the band’s power structure was changing. Mike Portnoy was writing more lyrics and trying to be more involved with arranging the music. Derek Sherinian was not Kevin Moore. This is not a knock on him, just a fact. His intro part to “Lines in the Sand” was nothing like the band had done before. It sounded more like the band U.K. Derek’s playing was more based in jazz and improv which was something Dream Theater was not really about. Derek’s keyboard sound was heavier and dirtier as well. This gives the whole album a different feel and it was something that his predecessor Jordan Rudess continued to use. The album really has a ton of variety on it. From the 80s era King Crimson-ish “New Millenium” to the acoustic driven, hit single that should have been “Hollow Years,” the album was very much about each song being different from each other. Let’s not forget it also has one of the band’s most popular songs “Peruvian Skies” plus the amazing epic “Lines in the Sand” which features King’s X frontman Doug Pinnick on guest vocals. If you have a section that should sound like Doug Pinnick singing, get Doug Pinnick. But the album also has some tracks that are less than perfect, which when you consider all those songs by passed by Kevin Shirley, it makes you wonder what could have been. “Anna Lee” was Sherinian’s contribution and while it’s a nice Elton John meets the Beatles kind of thing, if they had left “Take Away My Pain” as it was, there was no need for this ballad. The closing track “Trial of Tears” is a great song for the most part but the jam section in the middle shows that Sherinian was more of a “jam” guy who had an improv style versus being insanely technical. Sherinian would go on to become more technical but at the time he wasn’t. [Editor’s note: since people needed me to explain this section in detail, I added to it.] It’s kinda underwhelming compared to all the other epic songs in the band’s catalog. Lyrically as I said, Mike Portnoy decided to step up to fill the lyrical void left by Kevin Moore. Considering how lunk-headed Portnoy’s lyrics for “Just Let Me Breathe” are, maybe getting more from John Myung would have been wise. Unfortunately, this was the point where all of that was to change going forward. Portnoy made a rule that you had to write your own melodies for your lyrics or you couldn’t write any lyrics. This meant that JM was going to be shut out, which was probably the idea anyway. As a whole, “Falling Into Infinity” is a brave and experimental album and far more progressive than the one-dimensional “Train of Thought.” For all of it’s flaws, the songs are incredibly strong which considering all that was going on with the label and the band, it’s a testament to what this band could do. But what could have been? Had the other songs been included or some of the weaker tracks from the album been cut, I think this album would be considered one of the best that Dream Theater ever did. Also, as silly as it sounds, if the band had stuck to their traditional logo, it might not have pissed off the traditionalists (raises hand) at the time! The bottom line is that while this album is overlooked by some fans when counting Dream Theater’s best albums, for me it has way too many great things about it to be forgotten! This entry was posted in albums revisited, progressive metal, progressive rock and tagged editorial, music review. Bookmark the permalink. Nicely done. I was not aware of some the behind the scenes stuff for this album. This album is probably my least favorite from DT mainly because Kevin Shirley produced it. There aren’t really any songs on it I like either. That album simply doesn’t grab me. More on Kevin Shirley: The guy can’t record a good drum sound to save his life. Based on what said here it sounds like DT would’ve been better off without him. His mixing of Scenes from a Memory and Six Degrees… about ruined those albums for me. The drum sound just plain blows chunks on both albums. If the music on those albums hadn’t been so strong I couldn’t listen to them. Unfortunately, he has ruined drum sounds on albums of several bands I like. He is highly overrated. I am not a fan of Shirley’s mixing mostly because he seems to overlook the keyboards. I prefer Bottrill’s mix of SFAM because of the nuances in it. Shirley seems to hate that and just pushes the guitars up. I’ll be honest. I think the snare drum sound is an MP issue. The reason that David Prater used triggers on I&W was because he felt MP wasn’t consistent on the snare. I hadn’t thought about the keyboard mix. I’ll check it out. Out of the entire drum mix Shirely does, my biggest complaint is the bass drum sound. He basically crunches the bass drum into a clicking sound. There is no bottom end punch to it at all. I absolutely hate it. That sound is worse on SFAM and Six Degrees than it is on Falling. I can’t really comment on MP’s snare technique mainly because I haven’t paid much attention. There are too many tricks in the studio to even out inconsistent snare technique. I’ve haven’t noticed any inconsistencies when I’ve seen MP live though. However, at a show I’m taking in the band as a whole, so I may have missed it. The original plan from what I recall was for this album to be a double.